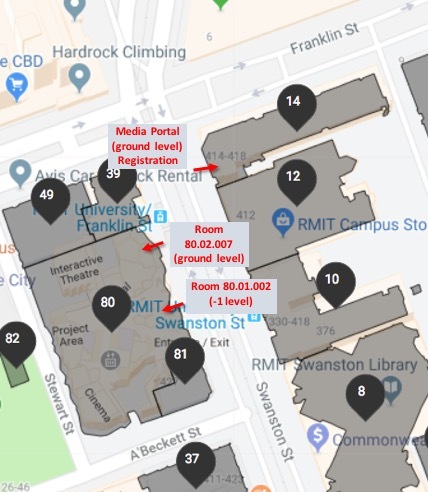 The Asian Biophysics Association Symposium and Annual Meeting of the Australian Society for Biophysics 2018 will be held at the RMIT University City Campus (map). It is located in the Melbourne CBD and within walking distance of public transport, restaurants, cafes, theatres, and galleries. The public transport system in Melbourne is accessed with a reusable travel card, which can be bought at train stations, 7-Eleven, and at the airport. Trams within the CBD are free (free stops are clearly marked). The closest train station to the RMIT City campus is Melbourne Central Station on the City Loop. From Flinders Street Station, you can join a connecting City Loop train service or any tram traveling up Swanston Street (see below). Most north-south Trams run along Swanston Street (routes 1, 3, 5, 6, 8, 16, 64, 67 and 72). For Elizabeth Street services (routes 19, 57, 59), get off at Melbourne Central and walk one block to Swanston Street. If you’re traveling east-west along Flinders Street (routes 48, 70 and 75), Collins Street (routes 109 and 12) or Bourke Street (routes 86 and 96) alight at Swanston Street for connecting trams. Many bus lines offer services connecting to train and tram services listed above. Check PTV Victoria for details of connecting services in your area. Bus connections (Skybus) operate from Melbourne International Airport and Avalon Airport (Geelong) direct to Southern Cross Station on Spencer Street. Tickets for the Skybus can be bought at the airport and Southern Cross Station and are $18 from/to Melbourne International Airport and $22 from/to Avalon Airport. From Southern Cross you can join a connecting City Loop train service to Melbourne Central station. Melbourne International Airport and Avalon Airport have a number of car rental companies. Dependent on the time of day and traffic the trips can take between 20 min – 1 h and 45 min – 1 h 30 min for Melbourne International Airport (driving directions) and Avalon Airport (driving directions), respectively. A number of taxi companies and car share companies operate out of the airports. 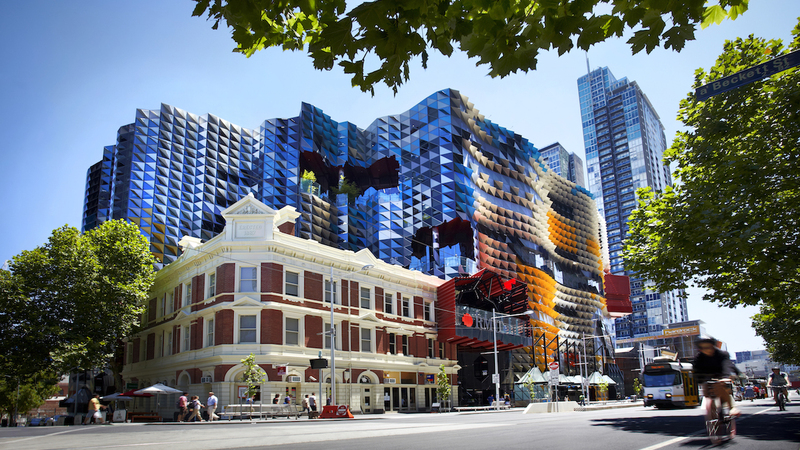 A taxi trip from Melbourne International Airport to RMIT University is approximately $60. There is no on-campus parking available for visitors to the University. However, there are a number of commercial car parks within a very short walk. Metered street parking is also available around the City campus. Please note, time limits and clearway restrictions apply. Melbourne has hundreds of accommodation options at all price points. The conference is not responsible for booking accommodation. Accommodation can be booked using standard accommodation websites.